Going under a marquee, I have entered Philippe Pareno’s show at the Palais de Tokyo. After being startled by the ticket desk that has been transformed into a light wall (La Banque d’accueil, 2013 ) I look around the transformed exhibition space. No sign to let you know where the exhibition starts. “No more reality, no more reality” is chanted loudly by children over that way so I am going. TV Channel is a 30 meters screen that is displaying five videos including the 1991 No More Reality. The sequence includes The Writer, a 2007 video showing the 18th century Jacques-Droz’s puppet writing What do you believe, your eyes or my words. The message coupled with the sound of the chisel and the unsettling disappearance of the image as I move towards the screen let me wonder. My eyes…? 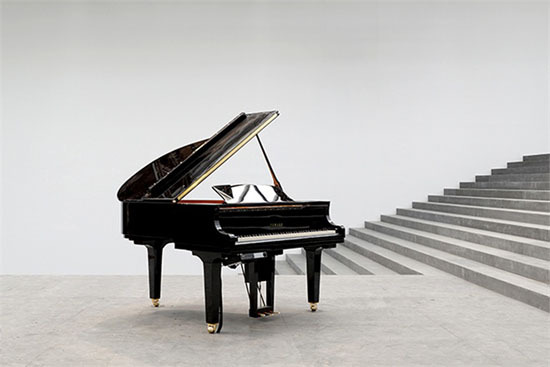 A puppet, Petrushka playing in the background, Liam Gillick’s first piano of the Factories in the snow, black sawdust…should I actually believe the words? Maybe not. ModifiedDynamicPrimitivesJoiningMovementSequences is a robot that has been built by Parreno and programmed by engineers to mechanically reproduce the artist’s handwriting. This process that could have convinced Walter Benjamin to write an essay blurs the boundaries between originals and copies. So maybe the reality lays within the small things that are lodged in our memory. In Fade to Black, phosphorescent posters present unfinished works visible only in long baths of darkness. 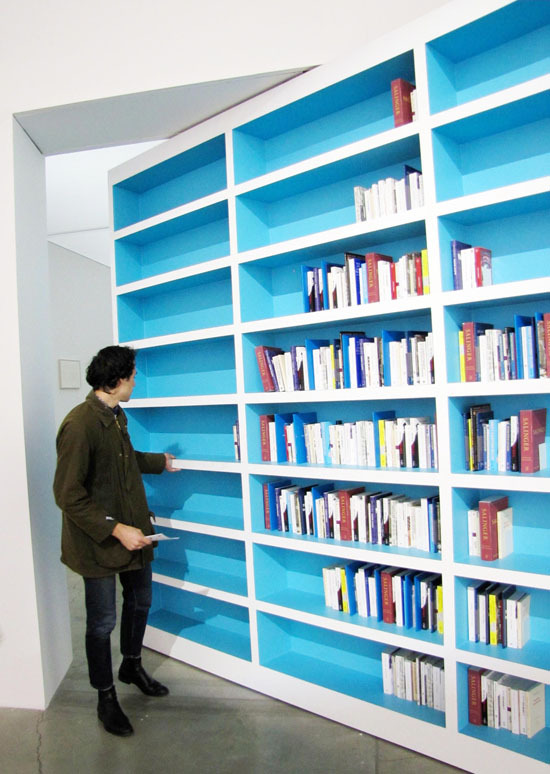 They are facing a library conceived by Dominique Gonzalez-Foerster; she selected six books that are meant to reflect the exhibition itself. The library is also a secret door that one pushes to enter an exhibition of works by John Cage and Merce Cunningham. A leap in the past since the show took place at the Margarete Roeder Gallery in New York in 2002. Each day in the course of this exhibition, a drawing by John Cage’s Ruoanji series was replaced by one by Merce Cunningham’s. This show, that reads like a music sheet, is a fond and pregnant memory that becomes part of the alternate reality I feel immersed in. As I think that I have grasped the meaning of things I have to retract. I am just “so fond of stillness” and compelled to find it “coupled with the show of movement”. 16 marquees create a ghost city where the unannounced performers of unknown shows are ever so present. And from there on the rhythm became denser to me like a bewitching Russian dance. Is the performer whose name is missing from the marquees the disembodied dancer of the installation How Can We Know the Dancer from the Dance? Or am I the performer going, in a seemingly choreographed fashion, from one screen to the next in Zidane: A 21st Century Portrait ? Is it Marylin’s ghost? “No more reality” can be heard again. And truly my reality has vanished. 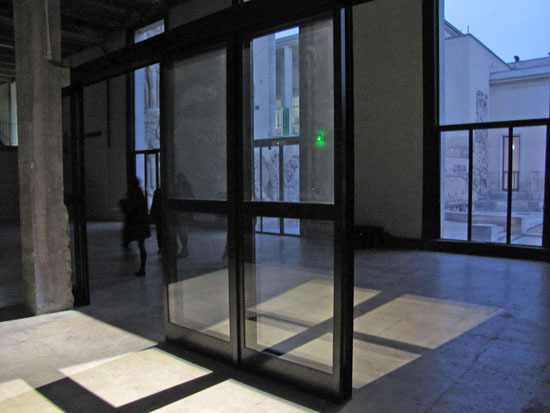 The windows of the Palais de Tokyo have been blurred. The outside world is nowhere to be seen. Automated Doors open and close in a mechanical ballet defining the space like Japanese fusuma and letting the sound from the outside come when they see fit. The creations communicate amongst themselves in a thoroughly orchestrated fashion. 56 Flickering Lights are to be found in the staircases and corridors, are twinkling like the 56 movements of Petrushka. Flickering labels display random thoughts along with factual descriptions. 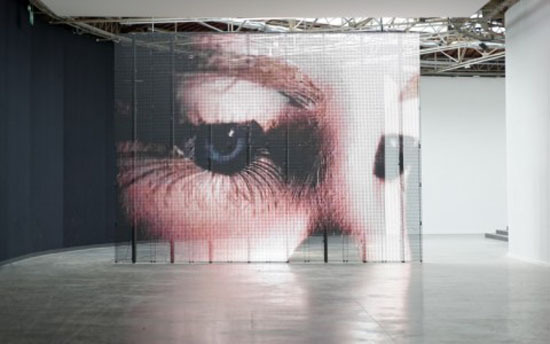 No More Reality is repeated every 18 minutes on all the screens and the tempo has been from start to finish imposed on me by Philippe Parreno. His masterpiece is the exhibition in itself. What can I say? I thoroughly enjoyed being his puppet and my soul truly exploded being Anywhere, Anywhere Out of the World. 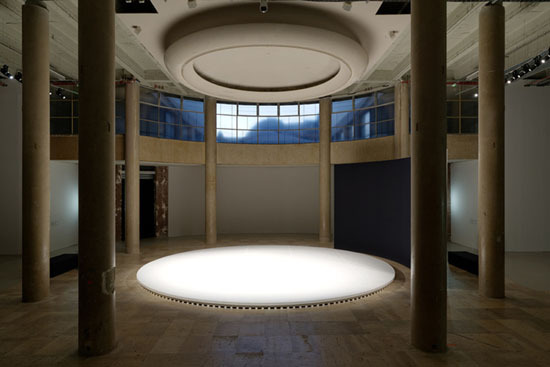 Anywhere, Anywhere Out of the World, Philippe Parreno, Palais de Tokyo, Paris, until 12 January 2014.